DBT scheme draft requires states to share burden 70:30, but states are in no mood to bear the burden. 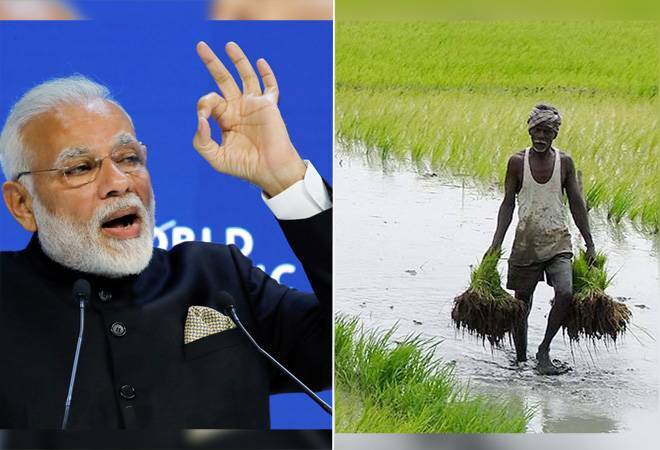 Centre will likely announce direct benefit transfer (DBT) worth Rs 4,000 per acre per season plus interest-free crop loan up to Rs 1 lakh per farmer in an instant two-fold relief to the farmers, sources in the know told BusinessToday.In. The initiatives will cost the Centre Rs 2 lakh crore towards DBT and another Rs 28,000-30,000 crore towards interest subvention, adding up to nearly Rs 2.3 lakh crore on an annual basis. At least the Rs 70,000 fertiliser subsidy scheme will be subsumed into the scheme to make it possible. Some other smaller schemes may also get subsumed. Having lost three crucial state elections to arch rival Congress in December, the ruling BJP-NDA is in hyper-active mode to appease the most aggrieved community -- farmers. It believes its scheme's impact must be felt by the intended beneficiaries well before the 2019 General Elections to deliver the political dividend it is seeking -- return to power. Centre has called quickfire meetings at the PMO as well as in NITI Aayog to finalise the announcement which is likely within this week. In this process, officials of nodal ministries -agriculture, revenues, expenditure, chemical and fertilisers, food, et al-have been asked to meet informally to iron out any glitches. Meanwhile, PM Narendra Modi is meeting farmer leaders to discuss the proposals. In his January 1 interview, Modi made it clear that the farm debt waiver is not an option he plans to consider. He is of the opinion that debt waivers in the past remained a wasteful exercise, and only end up helping a set of affluent farmers, not those who are worst affected. Officials in the establishment told BusinessToday.In that there are instructions to arrive at an out-of-box solution to farmer distress. Politically, the issue is becoming a hot potato after Congress president Rahul Gandhi put his weight behind farm debt waiver to attract the votes of farmers back to his party's fold. DBT will be given at the rate of Rs 4,000 per acre per season for cropping while zero interest loan will be at the rate of Rs 50,000 per hectare to be capped at Rs 1 lakh per farmer, sources told BusinessToday.In. The crop loan is already offered to farmers at a subsidised rate of 4 per cent only. Under the scheme, banks will not charge any interest up to Rs 1 lakh of loan. Centre had set an agri loan disbursal target of Rs 10 lakh crore in 2017-18 which had been achieved. Of that, 70 per cent is disbursed for crop loans. But with the whiff of a series of loan waivers, many banks have stopped extending loans to farmers. Officials say, the new scheme will open up avenues for farmers and will reduce input cost. Critics, however, say this may benefit the farmers in the future, but the mounting bad debts remain a worry. Banks have nearly Rs 3 lakh core as bad debt in the agriculture sector. Meanwhile, DBT will allow the government to directly transfer the subsidies to farmer instead of routing it via manufacturers and traders. Here's how the DBT will work: at the time of sale of agri inputs, details of the buyer, his Aadhaar, the quantity, land records, etc. would be captured using a point of sale machine. The Centre will transfer the benefits with the cap of Rs 4,000 per acre per season. This is as opposed to the Telangana model under which a fixed amount of Rs 4,000 per acre is transferred to the farmer at the beginning of the crop season. DBT for fertiliser has already begun in earnest in several states this year. Centre has also allocated Rs 70,000 crore towards fertiliser subsidy. "DBT works differently at present, with a limited but pivotal role of the manufacturers. With this, we will be successful in plugging the pilferage and will also reach the actual beneficiary," a top official told BusinessToday.In. The biggest drawback of the scheme, though, is that it will still fail to cover the entire universe of potential beneficiaries. "This is what we are discussing," an official said. Apart from battling this, the Centre is also required to get the states on board. After all, agriculture is a state subject, and the provincial governments too offer a series of benefits. Yet, there are few takers among the states to share the burden in the ratio of 70:30 as proposed by the Centre. States would prefer the entire burden is borne by the Centre. Especially, those run by political parties in the Opposition since they wouldn't want to share the political dividend of the scheme with the BJP. These states include Telengana, Odisha, Andhra Pradesh, Karnataka and West Bengal which either already have similar scheme or are in the process of rolling them out after an announcement. Whether the BJP/NDA can reverse its fortune with the scheme will depend on how quickly its impact is felt by the beneficiaries. The proof of the pudding is in eating. But time is slipping away.